For his third year as Artistic Director of Adelaide’s OzAsia Festival, Joseph Mitchell promised a “large focus on very personal and intimate stories told from Asia“. Two productions exemplify his approach: Filipino contemporary dancer and choreographer Eisa Jocson’s solo work Macho Dancer and Singaporean company Checkpoint Theatre’s two-hander Recalling Mother. A third production, British-Bangladeshi choreographer Akram Khan’s Until the Lions, is epically scaled, but shares with the other two works a theoretical framework that explores the constructed and contestable nature of gender. Performed by young men, often of low socio-economic status, to mixed audiences, macho dancing is unique to the Philippines, a distinctive though largely underground subculture of, especially, the capital Manila’s nightclub scene. Borrowing the iconography of normative Western masculinity, macho dancing performs a complicated deconstruction of gender. Unlike other forms of strip dancing, its movement vocabulary is slow, almost viscid, and heavily grounded. Its soundtrack ranges from American heavy metal to Asian power balladry, with performances working up a palpable sense of camp in the space between. Eisa Jocson wears khaki hotpants, a black singlet, kneepads, a necklace in the shape of a cross, and cowboy boots — black, with chunky heels and steel tips – which she frequently and commandingly raps on the floor. She makes her entrance onto the thrust stage through a fug of dry ice, accompanied by Metallica’s Devil’s Dance (“snake, I am the snake/ tempting, that bite to take”). Removing her singlet and stripping down to her underwear, Jocson exposes her breasts as the outline of a phallus becomes visible, unsettling our perceptions of her gender. Her body is muscly, athletic. Its energy is concentrated in Jocson’s thighs and legs, and expended in a series of impeccably balanced squats, knee-bends and lunges. We are invited to admire her ‘masculine’ physique, just as Jocson herself spends time flexing her biceps seemingly for her own edification. During a sequence that takes place in silence, she patrols the edge of the stage, fixing audience members with a hard, inculpating stare that suggests the performer’s complete control of the space. Jocson has written that the work activates a “gender loop,” contradictorily framing the dancer as a powerful physical presence while acknowledging the limitations of this power. Unavoidably situated within macho dancing’s socio-economic context, Jocson’s body remains both objectified and of uncertain social capital due to its transgressive nature. Her stage persona is grim-faced — a mask of dispassionate heteronormative masculinity — but Macho Dancer is a thoroughly playful work, locating joy as well as critique in its subversions. Bookended by aggressively posturing heavy metal and George Michael’s breathy, saxophone-drenched ballad “Careless Whisper,” it could hardly be otherwise. 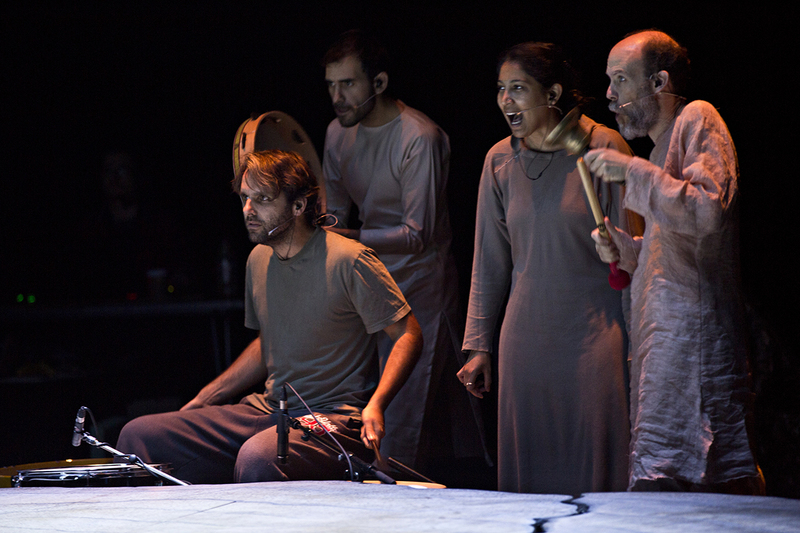 Having performed as a child in Peter Brook’s landmark production of The Mahabharata in the 1988 Adelaide Festival, choreographer Akram Khan returns to both the city and the Sanskrit epic with the large-scale dance-theatre work Until the Lions. Khan’s point of departure is Paris-based Indian poet Karthika Naïr’s 2015 collection of the same name — the title references a Nigerian Ugbo proverb, “until the lions have their own historians, the history of the hunt will always glorify the hunter” — which retells episodes from The Mahabharata from the perspective of various marginalised characters, many of them women. The woman at the heart of Khan’s work is the princess Amba (Ching-Ying Chien), abducted by the warrior Basheema (Khan himself in the original production, here portrayed by the Lengger-trained Indonesian dancer Rianto). Rendered unmarriageable, Amba kills herself and is reborn as the male-gendered Shikandi (Joy Alpuerto Ritter) who, as the “incarnation of penance,” ultimately slays Basheema in battle. Tim Yip’s set is a vast cross-section of a tree trunk. Prefiguring the battle ground it will become, it appears at first more grey than brown and ash- or bone-like rather than wooden. The trunk’s thick rings suggest deep history, its roundedness the Hindu conception of time as cyclical rather than linear. As the lights rise it is stuck with a dozen or more spears, one bearing the decayed head of an old warrior to which Basheema repeatedly genuflects. Perhaps, in its dead eyes, he glimpses his own fate reflected back at him. During the work’s dénouement the trunk will spectacularly split into three sections, smoke billowing from the fissures, as though Shikandi’s victory over the prince has upended the natural order, shaking the world itself. Incorporating Western contemporary dance and the classical north Indian form Kathak, Khan’s choreography is varied, emphatic and steeped in ritual. It is also sharply individualised. Rianto’s Basheema is unerringly vertical and straight-backed, an authoritarian figure. His limbs punch out like weapons from a body that moves — in tightly contained leaps and whirls —with military swagger and precision. Chien’s choreography compellingly tracks Amba’s journey from princess to warrior, the angles of her body sharpening, an initial fluidity hardening into something indomitable, almost machine-like. Ritter, meanwhile, registers the strangeness of the character of Shikandi — the progeny of a demon as well as the gender-shifting re-embodiment of the princess — in a series of remarkable disarticulations, limbs at odd angles, crab-walking or on all fours like a dog, scuttling around the stage at speed. Vincenzo Lamagna’s cinematic score effectively underlines the work’s sense of mythical struggle while four musicians seated around the edge of the trunk provide a mighty wall of percussion, sometimes using traditional instruments, sometimes pounding the stage with their fists. They sing, too, conjuring evocative atmospheres of war, loss and even celebration. If the work’s narrative sense is occasionally compromised by Khan’s febrile kinaesthetics, then its vivid and quietly transfiguring world-building — shaped, no doubt, by Khan’s grasp of our deep-rooted receptiveness to the mythic — is never less than compelling. Mostly told in the first person and past tense, the work’s storytelling mode is demotic and conversational, firmly rooted in the oral tradition. Layers of theatricality — such as the performers’ occasional slippages into physical and verbal imitation — are gently and sparingly applied. 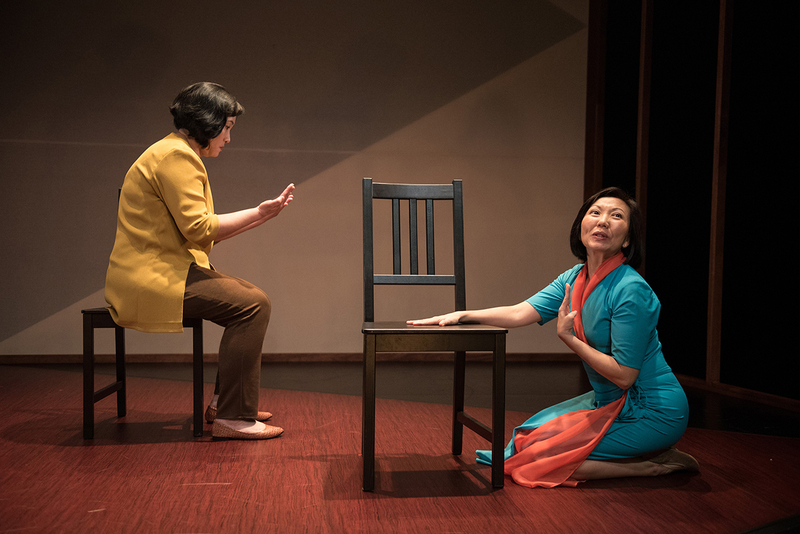 Personal histories are sketched out in relatable vignettes seamed with humour and melancholy (Mohamed’s mother was diagnosed with dementia in 2010 and Wong’s father died in 2016, both events worked into the show over successive iterations since 2006). Quotidian routines, especially those revolving around food preparation — the Malay rice dish nasi lemak, a popular school snack, is especially laboured over — are recalled in loving, fine-grained detail. For all the work’s lightness of touch, however, the shifting idea of ‘women’s work,’ as shaped over time by culture, class and generational divides, is central to Recalling Mother. Unsurprisingly, it is the mothers who perform most of the unrecognised labour, emotional and domestic. We learn that Mohamed’s mother, an uneducated former metal worker, is illiterate and that her first husband was abusive (“he was no good for us,” Mohamed says matter-of-factly). As the mothers grow old and infirm, the caretaking roles are reversed. At one point, Mohamed, now with a PhD, cradles her sobbing mother in her arms. Elsewhere, Wong traces her adoptive mother’s progression from “elegant, stylish” office worker to an old woman who struggles to get out of bed and watches too much TV. Even in the poignancy of such moments we are reminded of the distant place of men in these stories, an absence that hangs like a pall over these impressively resilient women. In her introduction, Wong describes Recalling Mother as a project of “honouring and remembering.” At the end of the night we are told the mothers’ names as the cyclorama fills with a close-up photograph of their aged hands, pale and bony, the skin coarse and flecked with liver spots. It’s an image of endurance, tender and tough at the same time — much like the play itself —that speaks to the too little acknowledged work of women, as makers of the home and of the world.